The PEN Ten is PEN America’s weekly interview series. 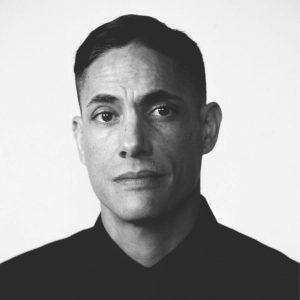 In this week’s interview, PEN America’s Public Programs Manager Lily Philpott speaks to poet David Tomas Martinez, author of Post Traumatic Hood Disorder, published this year by Sarabande Books. Tune in to Facebook Live on July 31 to see David in conversation with Saraciea J. Fennell as they discuss The Poet X by Elizabeth Acevedo for this month’s Read the Resistance book club. The writer’s identity is always about to be. The writer is always becoming, somewhere between who the writer projects themselves to be in their work and the actual “statistics” of their life. As my work pulls directly from my life it is important for me to accurately balance who I’ve been, who I am, and who I want to become. Like sobriety, I’m not sure many come to poetry because life is going well. For myself, I sure as hell wasn’t winning at life, at least not by many metrics I knew and valued: societal, moral, existential, philosophical, financial, moral, or amorous. Because at the time I lacked sufficient amounts of tiger blood, as Charlie Sheen sagaciously put it, I saw poetry as possibility, an escape from the minacity of corporate and/or middle-American standards. Ultimately, I think my relationship with identity can be listed as “complicated.” To reject identity is perilous, especially as a Chicanx. To side, even unintended, with Barthes that the “author is dead” or with the New Critics that “only the text matters,” could be siding with an ongoing eon in which the rise of writers outside the dominant perspective has been mitigated (read: white, male, hetero). Power strives to not only stay in power but also to create more power. As metaphor is a tool, identity is a tool. It is not an ever-encapsulating circumstance. Identity helps give shape to my writing by giving me a framework. Via identity I see the world, or via identity, I’ve done this, or via identity I desire that, which are all plot points so to speak. However, I think the writer’s identity is something to hold at a comfortable distance, never too fully believing in the narratives you yourself, as the writer, create. It’s a kind of self-publishing to believe to earnestly in your own ethos. All facts are alternative, to somebody. Obviously as technology closes gaps between disparate communities, tensions among competing narratives will arise. Do not get it twisted, all our arguments are about power, access. Even the “altruistic” left is looking for something. Though, I think it’s amazing that we live in a world where lying is accepted, even rewarded. It is a truly exciting time to be alive. Truly exciting in a bad way, like a fishtailing car that might flip or crash. This alternative fact and fake news phenomenon, while creating extreme tension, doesn’t necessarily create good art. What always lifts writing is language. By focusing on craft and by staying close to the language, my words lead me to psychological and emotional truth in ways that just thinking or talking about an experience can’t. There is a certain amount of discovery in the process and I find that in staying close to the language, I’m able to surprise myself. So I navigate the fake news era by focusing on my work. That is what is most dependable. Facts change. Societal standards differ across time. What we think as decorous today will be profane tomorrow. As language consists of signs, in the Saussurean sense, a chain dependent on other words for meaning, containing no meaning independently, writing acts similarly. A poem has no meaning unto itself. A poem is not an island, as Donne says. Once this is accepted then building on other poems and poets is only natural. My intention with repurposing phrases, ideas, or even parts of poems, is to recontextualize and reconsider them by shifting their context. There is a rich history in poetry, music, and in various other arts of the homage and the sample. Each successful rendition by a new artist adds something original to the inherited text. I’m deeply indebted to writers from a multitude of identities, including white male and female writers and thinkers throughout history. And in this way, the literary tradition is a variation of systemic power, and my writing within this tradition implies that I accept in totality the history. But accepting the history doesn’t mean condoning the violence. So by appropriating and riffing off the canon I hope to simultaneously assimilate and change the canon’s path, if at all possible. My work interrogates masculinity as an act of resistance. Class and sexuality, too. In my personal life, I resist drinking and indulging too heavily in whims as an act of resistance against myself, or the more issue-laden aspects of myself. I’m also doing my best to resist the performance of resistance, which seems very popular. I think I also have to resist too easily deciding on issues, allowing myself the patience to think before I answer or comment on situations, publicly and privately. That seems to me the resistance I am most settled within currently, a resistance to rash judgment, which I combat by trying to succinctly express how I think and what I value. Though this takes time. To this point, I have navigated systemic obstacles by being aware of them, but I find one of the biggest threats to expression is the current political regime; something I alone cannot navigate. Currently we are enduring attempts, some successful and some not, to defund the NEA, education on all levels, Planned Parenthood, EPA, just to name a few, while increasing our spending in defense, policing, immigration policies, and others. This cacophony of oppressive behavior by this regime seems to me the largest threat to free expression. In Hustle the book starts with me trying to steal a car so we could shoot somebody, anybody. The enemy to be killed, silenced, was me, or variations of me. That’s fairly daring because it’s true. Happened. In Post Traumatic Hood Disorder I talk about being molested. Also, happened. Twice. However, what I find most daring in PTHD is in my challenging of power, politically on all sides, and I did not preclude myself from this challenge. And this is the most daring because it’s not in the past, it isn’t something that happened but is happening, which for me is the hardest phenomenon to write within, what’s happening now. In my poetry, no. Though I have plenty of bad drafts working out my thinking. And as editors that have taken my work know, I am constantly working on a poem right up until it is published. It’s an issue. In my active living, I’ve written so many bad “drafts.” Learn. Change. Love. I think everyone should read Invisible Cities by Italo Calvino as the ultimate measure for how to put a book together. I’d like to highlight poets I’ve studied under (chronologically listed): Glover Davis, Sandra Alcosser, Marilyn Chin, Ilya Kaminsky, Tony Hoagland, Martha Serpas, Nick Flynn, Kevin Prufer, and David Rivard. All of these poets are must reads. 10. Along with being a poet you are also a talented cook, frequently sharing your creations on social media. Do you see a creative connection between cooking and poetry? Are there other ways you stretch your creative muscles in day-to-day life? Thank you for the compliment. Poetry and cooking both let me focus my predilection for craft. Both poetry and cooking are something we take in daily, sometimes as just sustenance, but can be something more if given care. Also, poetry and food share a special place in our societal valuing. When something is really valued, it’s often compared to either poetry or food. That says something, no? My favorite food to cook is Mexican, as I grew up eating it, but also because it keeps me connected to my family and history in a very physical and emotional way. And for me, one of the ways I express love to my family and friends is by cooking for them. If I can give just a fraction to my partner, my children, or my friends, even on social media, that feeling of standing next to a stove and being handed a warm, homemade tortilla that butter drips from as it’s put to your mouth, then I’ve done good for the day. Besides cooking I also like to flex in the way I dress, which has real correlations to cooking and poetry.